Mike “Quick” Swick keeps his name while throwing “punches in bunches” at his opponents in octagon. Swick started out as a child interested in being the Karate Kid, he claims.A� Things progressed from there and after his appearance on the original season of The Ultimate Fighter as a light heavyweight, he went on board with UFC full time.A� Swick took some classes but found his calling with UFC. Winning 14 of his past 16 fights, Swick is known for his fast and furious punching style.A� He takes his opponents down with punches early.A� Sometimes, it doesn’t work and he has to fight a whole match, usually still winning cheap genuine cialis uk. because of his punches. In his last match up against Ben Saunders in UFC 99, only his fourth match since dropping to welterweight, he won by TKO (punches) 3:47 minutes into the second round.A� He won “Knockout of the Night” honors as well. He was then set to fight Martin Kampmann at UFC 103.A� The winner of that match would be offered a chance at the title, versus George St. Pierre.A� Swick was injured while training and was unable to fight.A� He will replace injured Kim Dong-hyun in UFC 105 on November 14, 2009 versus Dan Hardy. Swick will set out to add another victory to his seven match streak.A� After this, he will continue to fight for his dream title. As the weather cools off outside, the mats start steaming.A� Grappling, wrestling, judo, MMA; all sports that steam up the inside of venues, even how to order viagra without pre. in the freezing cold. Grapplers from all over Pennsylvania are gathering, on Saturday October 24, to battle for the day in the Pennsylvania Grappling Championships.A� Hosted at Penn Tech campus in Williamsport, this is the first event of the season. Prizes for the No Gi absolute Pennsylvania Grappling Champion include $500 cash and a belt.A� Individual win points can also be put towards a team total.A� All men, women, and kids’ weight classes and ages will be accepted per NAGA rules. Registration is open online as all interested parties should do so in advance.A� Registration fee is $50 or $60 for families the day of the event. Doors open for weigh ins at 8 while grappling begins at 10.A� Spectator tickets are $10 and sold at the door.A� The PAGC will offer a special Saturday as part of Make a Difference Day.A� PAGC will be collecting body wash, shampoo, conditioner, dish soap and paper products for $1 off of admission price.A� All donations will be given to the Ronald McDonald House in Danville, PA.
Venture out to Williamsport for a live grappling experience.A� Breathe in the sweat and steam of the room and watch the intensity in the fighters’ eyes.A� Or if you’re a fighter yourself, get back on the mats.A� No matter which side of the mat you sit on, this is sure to be an event to see. Below is a sample of NAGA submission grappling, the style of this event.A� This event is ranked; all fighters must abide by the NAGA rules and regulations. It’s Fall, and that means it’s MMA season. New UFCs on Pay-Per-View, new episodes of The Ultimate Fighter and new regional tournaments. OK, I guess you could argue that every season is MMA season. But that’s no excuse for not checking out Lancaster, Pennsylvania for the latest talent showcasing: The Central Pennsylvania Warrior Challenge III. The Lancaster Marriott at Penn Square will play host to a 16-bout fight card featuring local amateur and professional fighters duking it out in what has become a standard MMA battleground, a 20-foot hexagon cage. The action doesn’t stop at just plain old amateurs and local professionals though; the headlining fight marquees a rematch between Braden Bice and Randy Smith. Bice, a 22-year-old from Mercer, PA took the first match between the two over two years ago, when they met for Battle Cage Xtreme II. A two-minute TKO/referee stoppage gave Bice the glory he yearned for. Life for Bice wasn’t all potatoes and gravy after that, however. A mixture of wins and losses over the next two years gives him a 8-9-0 record, and he knows he’s got something to prove Saturday against Smith. Smith, a 35-year-old out of New York, has found success after his loss on September 15, 2007 to Bice. He is 8-5-0, with six of those wins coming after the Battle Cage Xtreme II defeat. His wins mostly end in TKOs on strikes, and his plans for this rematch are sure to be similar to his recent past success. Amateurs are fun to watch as well, and fighting-hopefuls can always pick up tips from peers and their duels. So come on out, enjoy a few fights and support buy cipro online overnight shipping. your local fighters Saturday. I’ll even buy you a beer if I see you out. Maybe. UFC 106, set for November 21, 2009 in Las Vegas, Nevada, will host a battle at welterweight up for much discussion.A� Dustin a�?McLovina��a�? Hazelett (12-4) will fight Armenian Karo a�?The Heata�? Parisyan (18-5). Parisyana��s last contest, in UFC 94, was determined a�?No Contesta�? by NSAC after he tested positive for banned painkillers during a drug screening post-fight.A� Parisyan stated that he had a prescription for the drugs due to back and hamstring injuries.A� Prior to this overturn, he won with a split decision over Kim Dong-hyun of South Korea. Because of his hearing which ruled the decision a�?No Contesta�? and suspended Parisyan for nine months, Hazelett will be his first match up since the incident.A� Can Parisyan come back with enough strength to pick up a win, fair and square?A� Or will Hazelett prove to be the better man after his last match up? Hazelett last faced off against Tamdan McCrory in UFC 91.A� Hazelett won by submission using a painful-looking reverse arm bar.The match is shown below.A� Watch as Hazelett uses his legs and arms to secure McCrory’s arm and then begin twisting it until he submits. He was set to fight in UFC 96 but had order online drugs with a mastercard. to withdraw because of an injury.A� He will return to the octagon in his match up against Parisyan.A� Can Hazelett set himself up for an arm bar, a popular move winning him submissions in the past? Or will Parisyan have a few tricks up his sleeve to prevent it? Both fighters have 9 wins by submission and have gone almost a year without a fight.A� This fight will be particularly interesting to see whose comeback can win the match.A� Parisyan will have to watch Hazeletta��s arm bar as it has won him Submission of the Night honors in past match ups including in UFC 91.A� Hazelett might have to watch as Parisyan has the stamina to last an entire match.A� They two will prove to be a solid match in UFC 106 this November. 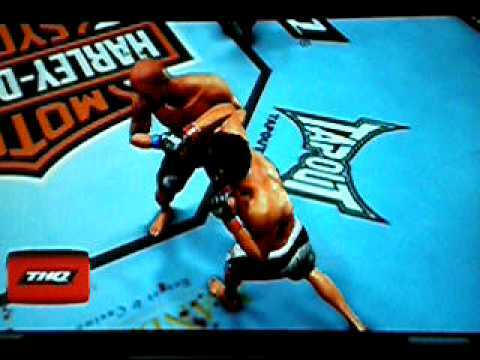 Mark Kerr, star of UFC 14 and 15, perfected it. It’s a move that sneaks up on you, grabs you and leaves you panting for breath as you watch your hand tap the mat through blurry, unfocused eyes. Now, it’s time that you learn it: the gator roll choke. Pretty intense, huh? The gator roll choke is really more like a dynamic arm triangle choke; you wait until your opponent makes a move to take you down, you avoid actually being taken down, and flip him over like you’re wrestling an alligator. Once his arm has been secured against his throat and your hands are clasped, you tighten your hold and cut off his blood flow. It takes an average person four seconds to pass out from having the blood flow to his or her brain cut off. Your opponent will be tapping out faster than the Pittsburgh Pirates getting eliminated from playoff contention (about 10 seconds after the season begins). You might think that the gator roll cuts off air flow, but that is not the case. The average person can survive without air for 40 seconds. If this submission technique cut off air flow, it would be a long battle and the opponent would probably be able to escape. Cutting off blood flow, on the other hand, makes it so that the opponent loses key senses and thinking power, effectively putting your body into a ‘sleep mode.’A� MMA fighters can withstand the gator roll choke for longer than four seconds of course, but if they don’t tap out soon after they WILL pass out. This move is directly related to other arm triangle chokes such as the D’Arce choke, where your opponent is in a arm triangle choke from the front headlock position and the choking arm is thread under the near arm, in front of the opponent’s neck, and on top of the far arm; and my personal favorite, the Anaconda choke, which is essentially the same as a D’Arce but the choking arm is thread under the opponent’s neck and through the armpit as you grasp xenical for sale. his biceps. Don’t try this move on your dog or an unsuspecting friend, as you may cause some serious damage as well as get strange looks from pedestrians. If you want a sweet new submission move to end your fights and gain serious respect, try the gator roll. Guillotine or Triangle: Who Will be Victorious in UFC 104? The Ultimate Fighting Championship hosts its 104th event October 24, 2009 in Los Angeles, California.A� The main event fight card shows match ups between welterweights Anthony Johnson and Yoshiyuki Yoshida, heavyweights Cain Velasquez and Ben Rothwell, lightweights Gleison Tibau and Josh Neer, Joe a�?Daddya�? Stevenson and Spencer a�?The Kinga�? Fisher, and light heavyweight championship bout between Lyoto Machida and Mauricio Rua.A� Set to air on Pay-Per-View, and just about every solid sports bar in town, UFC 104 will be a match-up worth watching. Stevenson boasts a 30-10 record and two killer chokes; the Guillotine and Rear Naked Chokes. A�He entered the TV reality show The Ultimate Fighter 2 as one of the more experienced welterweight fighters.A� Prior to the show, Stevenson held the 155A�lb (70A�kg). championship at King of the Cage and the 170A�lb (77A�kg). at Gladiator Challenge.A� He won The Ultimate Fighter 2 Welterweight Tournament and went on to drop weight and begin his career as a lightweight fighter. He defeated his last opponent, former Ultimate Fighter winner Nate Diaz, by unanimous decision at the Ultimate Fighter 9 Finale.A� Stevenson was the superior wrestler trazodone for dogs. and established control for the majority of the fight.A� This fight earned Fight of the Night honors.A� Check out the fight below. Next, Stevenson is set to match up against Fisher, an older but less experienced fighter. Fisher (23-4) entered the UFC world in Ultimate Fight Night 2 where he won by submission over Thiago Alves in the second round.A� He defeated his last opponent, MMA veteran fighter Caol Uno, by unanimous decision in UFC 99: The Comeback.A� Fisher boasts an effective triangle choke as well as 11 wins by TKO. This match-up between two experienced fighters is sounding like a must-see.A� While Stevenson has a few good chokes he can throw, hea��s also been caught in them before.A� Both fighters won their last match by decision.A� Both have only been knocked out once in their career.A� In this case, Fisher has a stronger recent past, winning his last 3 matches, while Stevenson shows two losses before his last victory.A� It may be a grappling match to the end, resulting in a decision dependent upon who gets lucky enough to make their choke first.A� Occasionally, there’s a clear winner.A� This time, it could be any man in the Octagon. Who You Callin’ A Welterweight? Ever since its advent in 1993, The Ultimate Fighting Championship has been the paramount battle ground for mixed martial artists. It has been and still is the event fighters participate in to prove their prowess and skill not just to themselves, but to the world. Greats such as Chuck Liddell and Randy Couture passed through this system and gained international fame by beating opponents into submission there. So here we are, at UFC 104. Wow. One hundred and four contests. The proving grounds are no longer graced by the likes of Liddell and Couture however; the grounds of UFC 104 belong to Anthony Johnson and Yoshiyuki Yoshida…at least in the welterweight category. Johnson, an American fighter known for his kickboxing style, owns an impressive 7-2-0 record, with both losses happening to have been in UFC events. His last fight was against American Luigi Fioravanti at UFC Fight Night 17 (taking place between UFC 94 and UFC 95) on February 7th, and the result was memorable: a four-and-a-half minute technical knockout of Fioravanti on punches. Watch the fight, and as you watch you’ll see Johnson’s a pretty intense fighter. Yoshida is a Japanese fighter known for his Judo style and a solid 11-3-0 record. His last fight was in the welterweight division of UFC 98 on May 23rd against former Navy SEAL American Brandon Wolff. And guess what? Yoshida put the ex-military man in a Guillotine choke that would make even Dana White cringe. Don’t take my word for it though; check out the video and see for yourself. Anthony Johnson might want to make those last minute changes to his will sometime soon. UFC 104 looks to be a great match-up, especially terramycin for cats. in the welterweight class. A battle between two fighters in their prime always makes for great TV, and you don’t want to miss it. UFC 104 airs live on Pay-Per-View Saturday, October 24th at 10 p.m. Get excited with the preview video below and be sure not to miss what your buddies will be talking about for weeks afterward. Ben Henderson – Extremely solid submission defense and submission awareness. Able to stack cerrone and keep his head high to deliver precise punches in Cerrone. Wrestling skills helped him dominate in the 2nd and 3rd rounds, but he lacks where can i buy cytotec in the us. the wind for solid late round takedowns.Standup game was crisp, but too close to even with donald. Cerrone – Crisp striking, and strong ground submission attempts gave henderson a lot to think about all night. While henderson managed to do more damange with effective ground striking in the 2nd and 3rd, Donald offered more submission attempts and probably the cleaner overall standing strikes, but takedowns carried the balence with the judges. Scott – showed impressive ground and pound, was solid in his transitions. Effective straight punching. tendancy to head hunt, but it paid off, most effective strike was a jab-cross that dropped white. Almost got finished with a triangle when he dropped in to pound out white near the cheap birth control no prescription. end of the fight. Should consider making opponents stand up when they are hurt, and he has such a dominent skill advantage standing up. White – Ground game was effective at times at preventing damage, and maintaining position. Most significant attack was a submission attack from the bottom after getting dropped by a jab cross. Needs to work on his stand-up game if he is going to progress to the next level, because is ground game isn’t impressive enough to be a dominant threat. Say you were a world-class MMA fighter, and you wanted to showcase your skills. Before 2007, there was only one organization you needed know: Pride Fighting Championships. Pride was a Japan-based MMA organization that held more than sixty events, one of which, Shockwave/Dynamite in August of 2002, held the largest live MMA event audience record of over 70,000 people. So how did this hugely successful organization come to an end? Read on to find out! Conceived in 1997, Pride Fighting Championships held events that searched for ‘the world’s best fighter.’ The Pride Grand Prix was one of the first events to pose the competition, with American fighter Mark Coleman winning national fame and recognition, as well as the tournament. In August 2002, Pride teamed up with Japan’s leading kickboxing and fight promotion, K-1, and held the world’s biggest fight event, Shockwave, (known as Pride/K-1 Dynamite!! in Japan), which attracted over 70,000 fans. That’s more fans than the Washington Redskins and the Cleveland Browns combined have attracted all season! (Probably). Riding it’s new millennium success, Pride introduced multiple new events in 2003: Bushido (Japanese for ‘way of the warrior’), a series of events focusing on the lighter weights of lightweight and welterweight fights; Total Elimination 2003 and Final Conflict 2003, a two-event middleweight grand prix that added Critical Countdown 2004 a year later as a third event; and annual tournaments in the following years for all weight classes. Needless to say, Pride was at the top of its game. So what happened to Pride? It became so popular that it realized it’s own success and looked to go even higher. By 2007 UFC had already established itself as the premier fighting organization. In March, Pride was sold to UFC, they merged, and Pride had how many bupropion to get high. realized it’s full potential. Today, the only true way you’ll get to see a Pride event is on DVD. UFC is now a dominant force, and Pride is now a member of the strongest MMA promotion family in the business. Check out more about Pride here, as well as the video embedded below.